This 1986 study offers a challenging contribution to the on-going critical debate surrounding the English literary Renaissance. 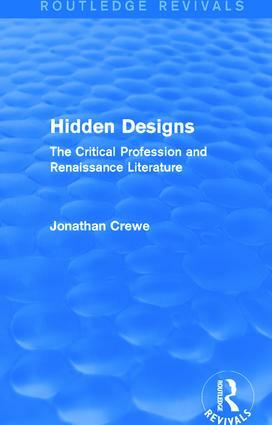 Although informed by the ‘new historicism’ and post-structuralism, Hidden Designs makes a plea for criticism to be practiced in its own name rather than in the name of theory, and opposes the hyper-professionalisation of literary studies in favour of the broader communal functions of criticism. Major Renaissance authors and their recent critics are placed under ‘suspicion’ as Crewe explores the elements of ‘criminality’ inherent in the powerful interests –personal, institutional, political and cultural – served by the literary enterprise, or channelled through it. Revisionary readings of Sidney, Spenser, Puttenham and Shakespeare are linked by a continuing commentary on the history and theoretical claims of Renaissance criticism.